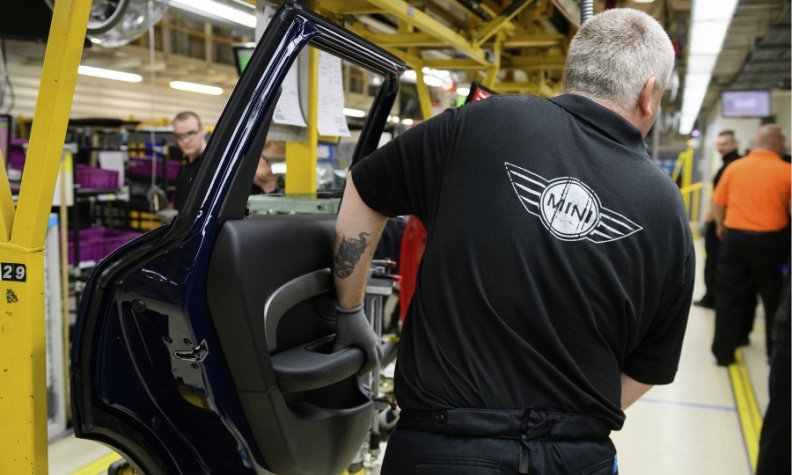 BMW build the Mini brand at its plant in Oxford, England. LONDON -- British workers at BMW Group plan eight strikes over the next few weeks to oppose plans by the automaker to change their pensions, the Unite union said. The strikes are planned to begin with a walkout at the automaker's Mini plant and at an engine factory and a pressings plant, the union said. Up to 3,500 workers at four sites could take part in the action which includes working to rule and a ban on overtime. Unite said the first strikes are planned for April 19 at BMW's Hams Hall engine facility near Birmingham, the Mini plant in Oxford and at a site in Swindon that makes pressings and parts such as doors and hoods for the Mini. In Britain, BMW builds over 210,000 Minis a year in Oxford, nearly 4,000 Rolls-Royce models at Goodwood in southern England and more than 250,000 engines at Hams Hall. BMW plans to close two final salary pension schemes and move all staff to a less generous scheme which new starters have been part of since 2014. The automaker has said it wants to act now to secure the long-term viability of its pensions but is prepared to talk further. "The company has put a number of options on the table to help employees transition to the proposed new pension arrangements and it remains open to negotiation," a BMW spokeswoman said.